Moving away from all that is familiar and safe is never easy. It means stepping away from the ease of knowing where you’re going without directional assistance. Have you ever driven to a place so many times you only remember the starting off point and arriving: as if your car was on autopilot? An ease that allows your mind to rest and just be. Now, this new place where we live, mixed with all the crisis scenarios we can finally put to rest – strangely called home, still, has felt like destination unknown. As creatures of habit we come to rely on what we know. We cling to not having to explain or edit ourselves. We get all warm and fuzzy thinking about the familiar places we love: the grocery store that has the best selection of produce, the butcher that knows what we like, the hairstylist who understands our needs, shops that always carry that perfect gift, family members who unconditionally show their love. And sister friends who get us. The ones who allow us to be on autopilot. If you’re lucky enough you have at least one sister friend. You know – framily. Helping you feel free to move about the world, a little better for having known them. The women who know the origin of your bruises, the ones who help them to heal. The ones who see past the ugliness of it all and laugh whether it’s politically correct or not. Being with sister friends is akin to closing your eyes and inhaling a deep long cleansing breath; restoring your soul and reviving your spirit. Leaving you refreshed to face the world again. While visiting our hometown of Frederick, Maryland recently, I was able to catch up with some of mine. I was reminded how easy “home” felt: like being softly propelled forward on a warm congenial puff of air. Yes. Weightless. As I visited with each of them, the moments I shared with my sister friends left snapshots in my mind: vignettes of the stories that frame our lives. Sipping martinis and toasting to friendship with Caryn. Laughing and talking non-stop, each attentive to the other, promising our waiter we really would shut up long enough to order. There are certain friends that even though you’d like to, you don’t see or talk to everyday; but when you finally do it’s as if time stood still. We reminisced, we looked forward to new adventures in both our lives. And as we remembered a past moment, our hands reached through time, across the table as an acknowledgement of how very far we’ve come. I miss looking out my back window knowing she was right there on the other side of the fence. It was hard to recognize the life moments we lost during Michelle’s divorce. Each one precious and unretrievable. But nevertheless, it was life affirming to realize the bond we had was even more unbreakable, still. Our longtime friendship is larger than the moments we missed. We’ll only look ahead now as we create new memories. Realizing the life events we’ve shared are the very glue that bind us together. Now – even stronger than ever. Julie, one of my ginger sister friends, is someone I met a few years ago but feel as if I’ve known forever. We’re still amazed at how our lives, past and present, mirror each other in so many ways. And if all our uncanny similarities weren’t enough, she’s also a fellow writer. We spent the day together – first introducing me to a new friend, an amazing lady whose present life resembles my past life in a wonderfully eerie manner. Afterwards, we walked through the park talking about everything and nothing the way “sister souls” do. We strolled downtown on a gloriously sunny afternoon as we continued our gabfest over ice cream, cappuccino and window shopping. Next, onto meeting two other friends for dinner as we celebrated life and friendship. Truly a day to be savored. Antiquing, laughing and girl-talking my way through a flea market with Leesa, my other ginger sister friend, was the ultimate recipe for a perfect morning. 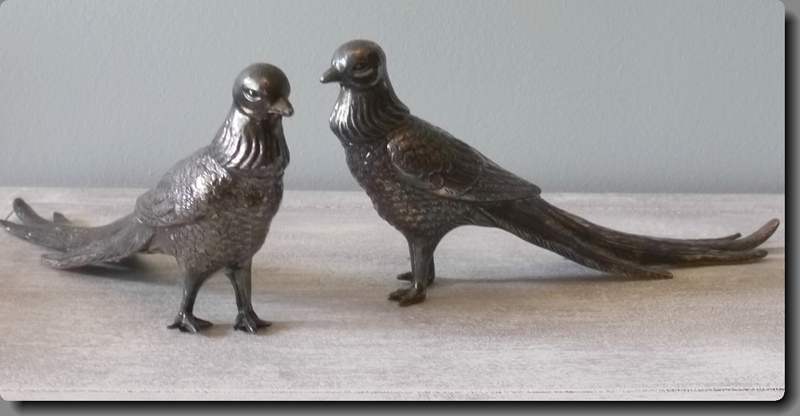 I was touched that she’d remembered my love of pewter and on a prior trip found a beautiful set of pewter peacocks. So before we did anything else she led me to these beautiful birds in the hopes that I would love them too. And I did! We searched for teacups to add to her china collection and without trying, we each found two that perfectly complimented the other. She is indeed that friend who always thinks of others…without even trying. My friend Pat, has known me the longest. She was one of my first sister friends. She is that friend who always sends a birthday card on time, unlike me. Her thank you notes are written in lovely cursive writing with the most thoughtful of words. We share an obsession with pearls among many other things both silly and serious. Each cherished moment spent together is like slipping through the portals of time while our hearts embrace today. Whether I pop in for a drink or a full course meal she always makes me feel special in every way. Krista, the friend I won in the divorce. Our old neighbors divorced, and eventually John met Krista. She had me at hello. She’s an old soul with a huge heart. As we ate the delicious meal she’d prepared we vowed to not let so much time pass between visits. And I was reminded once again, there’s nothing we can’t talk or laugh or cry about. Nothing. These are the easy, cherished moments I miss so much. Having a sister friend: whether you’ve known each other for a long time or just briefly feels as if there’s a kinetic energy transferring our past lives to present day…connecting us to now. To each other’s heart and soul. Moments spent with each of these ladies always involves moving easily through a myriad of subjects. Tossing life stories back and forth as if they were balloons floating effortlessly between us: suspended in the air as long as we need. Allowing both our hands to give and receive alike – width a depth of compassion and joy that’s immeasurable. Being a sister friend is an exercise in selflessness. It means foraging ahead for that pewter peacock. Your only reward, a smile on the face of another. It means listening when you want to talk, as well; knowing theirs is the greatest need. It means being inappropriate. It means being flawed beyond measure together, as the flaws are the most astounding measure of our beauty. It means not having to explain yourself so you can actually be yourself. It means being with each other…laughing until you cry and crying until you can laugh again. It means going home and moving away. Sister friends don’t know a state or region. They don’t know exclusivity. Sister friends are everywhere waiting to find a commonality with a brand new friend who feels like an old friend. Whether it be near or far, where old souls and new souls gather together…there is a place called home. Going home. In all its resplendency, its bittersweetness of time and place: teaches me that to move away from all that is familiar is to vividly brighten the green, green grass of home. I’ll always have my snapshots of each and every one of these amazing women to turn to when I miss them. Visits to look forward to. And my peacocks that will soon be proudly perched on our mantel. But here, this place called home, is happily where I am. Where my heart has come to recognize the ever changing shades of green. Finding home is not a destination but a place within one’s self. And now I must turn my eyes to search for blue herons. I hear they’re abundant down south. This entry was posted in Life, Philosophy and tagged compassion, courage, Empty nest, friends, friendship, home, Inspiration, joy, life, Moving, NESTpirations, old soul, sister friends, stories, vignettes, Women, writing. Bookmark the permalink. This is lovely, Karen – you have a generous heart and a willingness to bond. You deserve to have so many close friends – sister friends. Every word here speaks to me, since I am soon moving away from a place that has been familiar for the past four years. My guy and I are making new roots (again) in a new country (well, in the same country, but New England can’t be further from SF Bay Area than Hawaii from Siberia! 🙂 Anyway, the point is that you remind us all so well that it’s who we take with us in our hearts that matters, wherever we go. I’m blessed to have some wonderful sister friends, and I look forward to making more in our new home. I also feel like I’ve made some terrific ‘webbed’ sister friends, other bloggers like me, and I place you in that category. THANK YOU. Thanks so much, Pam! I love it…’webbed’ sister friends and feel honored to be in this category. (I feel the same way, too) there are some people that make me want to reach through the blogosphere and sit down with to have a drink…you are indeed one of them. Lovely post, Karen! Although I have a wonderful sister, my sister friends are just as important. Friendships going back 40 years are worth hanging on to…so many wonderful memories. Hi Karen! Thought I’d drop in and I’m so glad I did. This post is so honest, so familiar, so true to my own heart. I’d never thought of the term sister friends before but I’ll use it forever now. My girl friends are so important to me, we’ve been throughout so much over the years, just like you and your sisterhood- they transcend anything else. Great post! Thank you for stopping by. Glad you have a new word to use with your sister friends! My friends and I coined that phrase years ago after feeling as if we were each other’s chosen ‘framily.’ Sister friends are the. best. – aren’t they! Wow what a blessing to have “sister friends” and not to be taking for granted but always appreciated and treated like the precious treasures they are. Thanks for sharing Karen. Thank you for stopping by my blog! What a great discovery to have seen yours. We share friendship with several bloggers. I love this piece. It is perfect. We are moving to Delaware soon, and I am leaving behind a childhood friend. We both grew up in Birmingham and attended the same college–even the same major. We found each other years later in Lynchburg. I will take the train back for visits! Hi Catherine! I’m so glad I ‘discovered’ you and your blog! Sad, though, you’re moving to Delaware. I would love to meet you someday. job with this. Additionally, the blog loads extremely quick for me on Internet explorer.